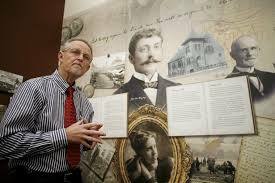 New Britain, CT – “Hartford does not claim to have made the first automobile but does claim to have started the automotive industry,” This statement was made by pioneer auto designer and engineer, Henry Cave, who worked with Daimler Motor Company, Locomobile and with George B. Seldon to design, develop and demonstrate the first Seldon patent car. The very first Hartford-based company to work in the automobile industry was the National Machine Company in 1891. Located at Capital Ave and Woodbine Street, they made motors for Steinway-Daimler, the engine that established the auto industry in Europe. But five years later in 1895, the Pope Manufacturing Company established the Motor Carriage Department and experimented with gas powered automobiles. Their conclusion was that these cars were very noisy, vibrating, greasy and complicated to operate. They also believed that the wealthiest citizens, the only ones who could afford such a vehicle, would not be interested in such a car. 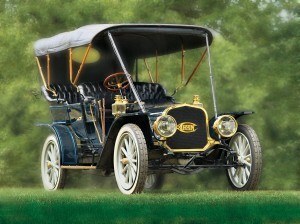 The Pope Manufacturing Company concentrated their efforts into designing and developing electric engines and in 1897 formally offered to the public the Columbia Electric Phaeton for a price of $3,000. Henry Cave reports, “Under the direction of the production experts, these handsome vehicles were the first to be made in this country on anything like a substantial basis.’ The Hartford Times wrote,” Its cost of maintenance and operation should be much less than that of a pair of horses…never found anyone so stupid that they could not run the carriage but there are many who can’t handle a horse…6 or 8 inches of snow “no obvious obstacle”. The first vehicles made were made under the Columbia name. Pictured here is a Columbia Mark III Stanhope, an advertising post card produced by the Pope Manufacturing Company. The vehicle was quite simple with four bicycle wheels and seating for two. It had a gong (forerunner to the horn) and four electric lights to illuminate the way at night. One of the first well known owners was Andrew Carnegie. The Klingberg Vintage Motorcar Festival in New Britain, CT on June 20th, 2015, will feature many automobiles manufactured in Connecticut including examples from Pope Hartford, Columbia, Corbin and Locomobile and is in fact the largest gathering of these early “brass era” cars in the country. 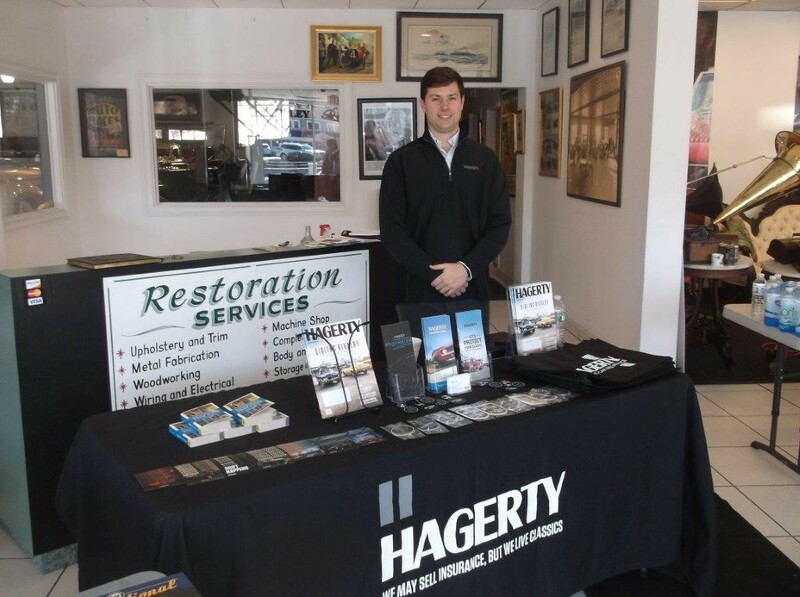 New Britain, CT – Once again, Klingberg Family Centers is invited by the Connecticut Automobile Retailers Association to create a display of antique vehicles for their annual car show at the CT Convention Center in Hartford on November 21-23. The exhibit last year featured four exquisite and rather rare examples of early 20th century vehicles from the collections of area enthusiasts who support the annual Klingberg Vintage Festival. 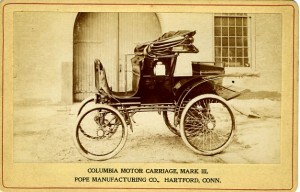 The group included a 1903 Pope-Hartford manufactured in the capitol city and a 1905 Stevens Duryea made in Chicopee, MA both owned by Jerry Chase. 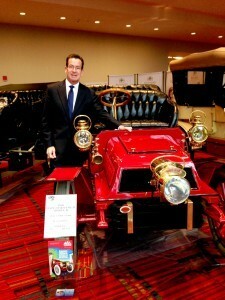 Also on display was one of 38 remaining 1905 Ford Model Fs, owned by Carlton Pate. You couldn’t help but stop and gaze at a 1934 Lincoln Brunn Convertible Victoria which is one of only 12 made and one of three known to still exist. This gorgeous car was recently purchased by Wayne Carini of Chasing Classic Cars. Wayne was on hand on Sunday of the show to greet those who stopped by the exhibit. And, nearly everyone did stop by all three days of the event. The exhibit was positioned right at the entrance to the auto show in a wonderful, spacious location. 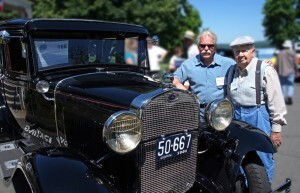 Klingberg Family Centers’ involvement started five years ago when the Association wanted to feature several Connecticut-made automobiles from the early 1900s. They turned to Mark Johnson, Klingberg’s Vice President of Development and organizer of the annual Vintage Motorcar Festival in June. Since then, the Automotive Retailers have served as a Gold Sponsor of the Klingberg event. 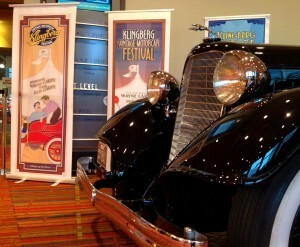 New Britain CT June 2, 2014 – Klingberg Family Centers will be hosting their 22nd Annual Vintage Motorcar Festival on Saturday, June 14. The event is held on the agency’s 40-acre hilltop campus in New Britain to raise support for their programs serving children and families across Connecticut. A special emphasis on recognizing Dads makes this a wonderful way to celebrate Father’s Day weekend. Wayne Carini of Velocity’s “Chasing Classic Cars” and his Dad, Bob Carini serve as Grand Marshals of the festivities. 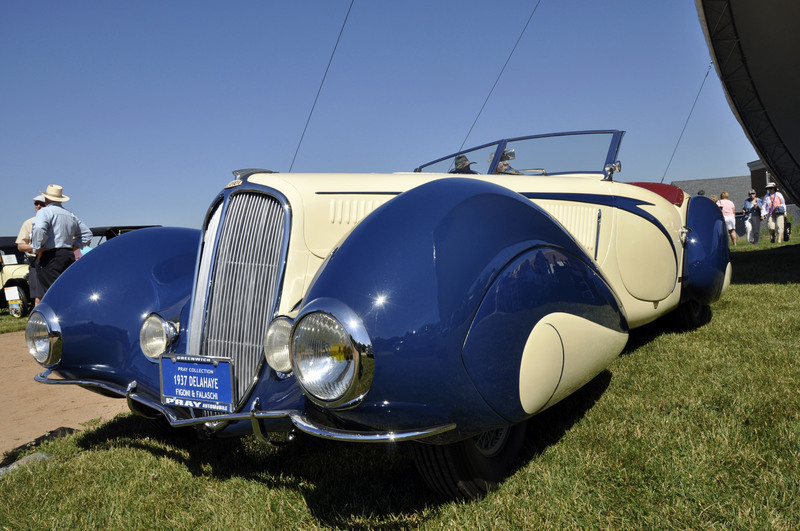 The event features a traditional antique car show (1972-older) plus an exclusive Concours d’Elegance display of truly vintage, pristine and rarely seen automobiles. 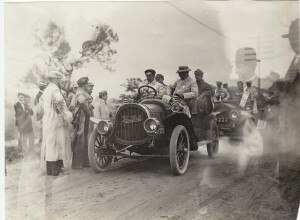 A highlight of the show will be a number of Connecticut-made cars from the turn of the 20th century including the Corbin manufactured in New Britain, the Pope-Hartford and the Locomobile. 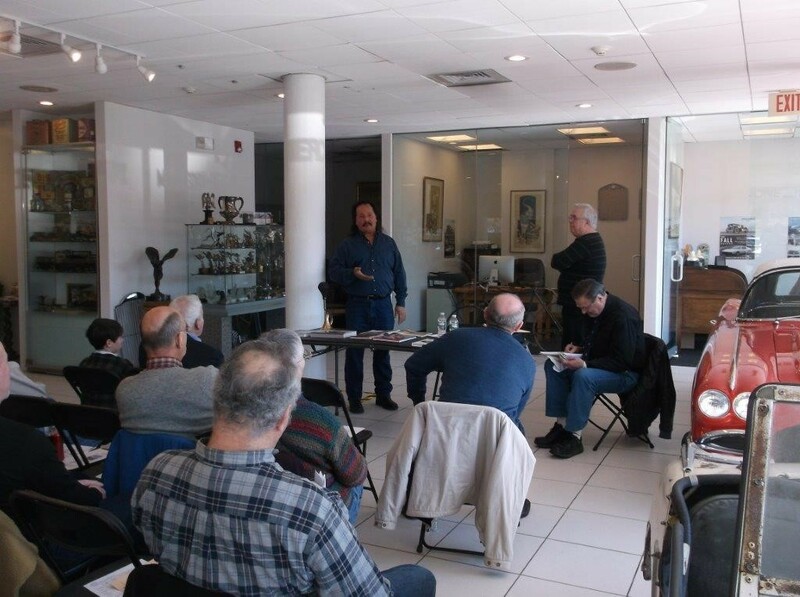 Amy Kirby of the New Britain Historical Society is arranging for a group of local actors to perform full-costumed portrayals of area businessman like Colonel Albert Pope and Philip Corbin who influenced the burgeoning auto industry in Connecticut in the early 1900s. There will also be an assortment of “Super Cars” on display by invitation, including Corvettes, Ferraris and Maserati’s. Professional DJ and announcer Dave Salonia provides a fabulous selection of vintage music and oldies favorites for the crowds to enjoy all day long. Dancers from the Fred Astaire Studio in West Hartford and the Stardust Dancers will light up the dance floor with a selection of ballroom and vintage dances throughout the show. New this year is a photo booth where friends and families can take fun snapshots to bring home as a memento of their day together. An expanded variety of children’s activities and entertainment make this a fun-filled day for kids of all ages. Spectator admission $10.00; Seniors 65 and over $8.00; Children 12 and under free. ALL spectators’ parking is free at The Rock Cats Stadium at Willow Brook Park. Prompt and efficient free shuttle service will be provided by DATTCO. No dogs or alcohol allowed. Proceeds benefit Klingberg Family Centers’ programs serving children and families across Connecticut. 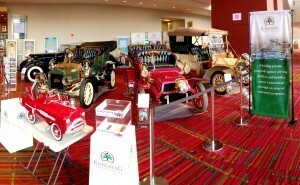 For more information, directions and weather-related updates visit www.KlingbergAutoShow.org or call (860) 832-5526.